Hi everyone! It's Kim Teasdale here with Christmas tag that is very reminiscent of the weather that is currently going on outside of my window :) I love a good snowfall and there is something particularly magical about seeing it at night with the Christmas lights shining (we don't get a lot of snow along the coastline where I live). 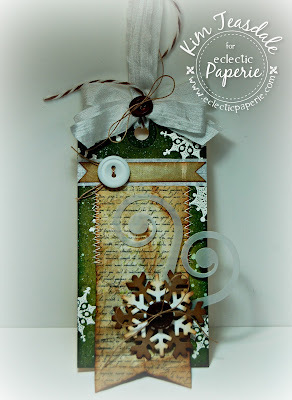 Ok, enough about the weather and onto my snowy tag :D I started out with an Inkssentials #5 Manila Craft Tag and then went to town adding layers of Ranger Distress Inks to create the background (Shabby Shutters, Peeled Paint, Forest Moss, Pine Needles, Antique Linen and Vintage Photo) with my Inkssentials Foam Blender. I created more depth around the edges of the tag with the darker inks and then added some "snow" with some watered down white acrylic paint in a Mini Mister :). 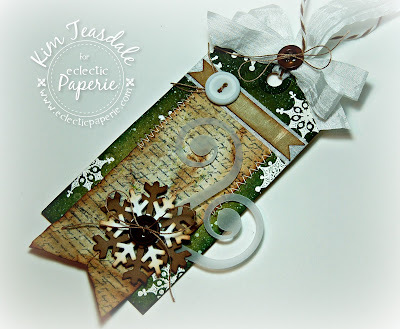 I then added some of the the snowflakes from the Graphic 45 Nutcracker set to add to my whole snowy theme. I ended up heat embossing them with white embossing powder so that they really stood out against the green backdrop. I really like the earthy colors on this elegant card. I appreciate the way you had some of the elements go beyond the edges of the tag base. Nice! Kim T! I miss your posts!! Beautiful tag, love how you layered the pennant on top of the tag...stunning! Whoa! 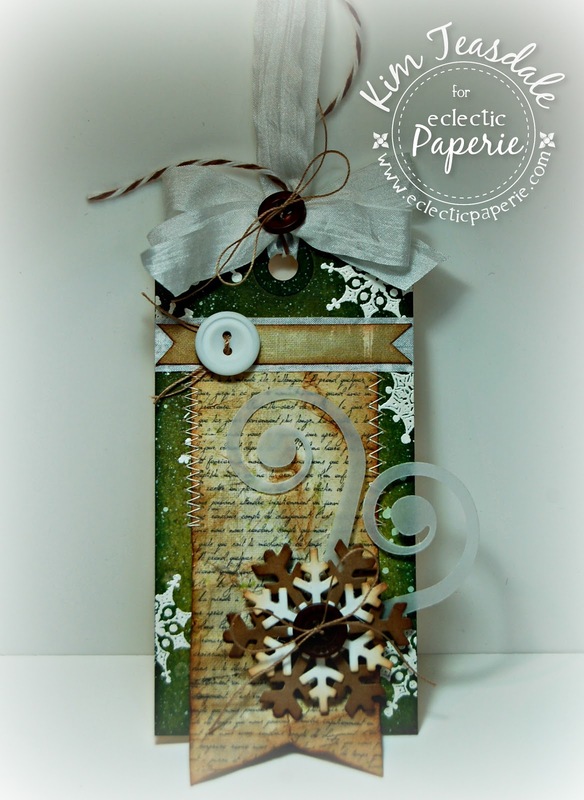 The colors you used on this wintery tag caught me by surprise, but I really love these beautiful colors on your tag. Gives it a wintery woodlands look. Love It! Absolutely fabulous tag - love everything about it! The layered look is great, and the banner shaping to the top tag, and the colours, textures and detailing are all beautiful. Beautiful tag! The layers and dimension are wonderful, as is the colour palette. great use of the fishtail banner and white embossing. I really like the stacked snowflakes and the stitching detail.